So, with the bench knocked over, it's back to the mast. 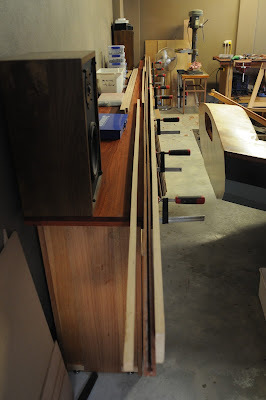 The plan is to build a modified birds mount mast, from Jarrah and Tassie Oak, with a sail track cut into the back. I previously knocked out a prototype, so I could figure out how I was going to do this The prototype is just 30cm long. The real thing is 6.1m long. Unlike a regular birds mouth mast, which has a structure that's self-supporting and self-cantering, and thus keeps itself straight during assembly, my modified birds mouth doesn't. 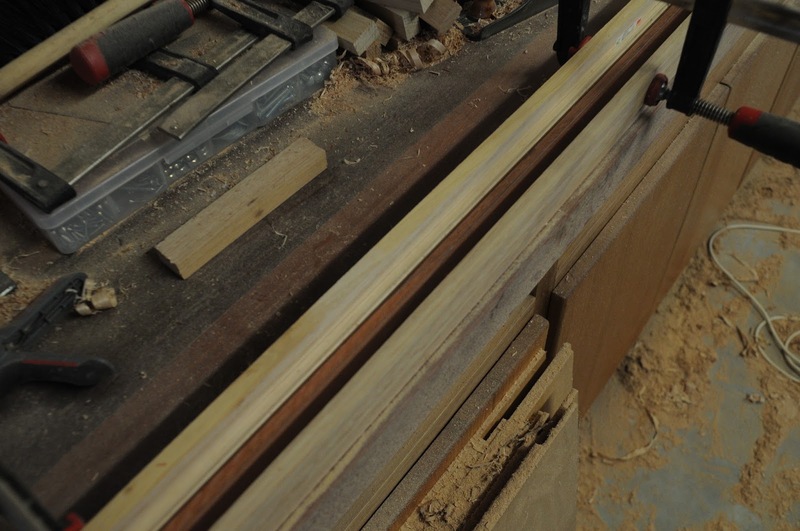 I've already constructed the sail track section from two pieces of Jarrah. This exercise in wrestling a pair of floppy staves on the floor of the hallway was what convinced me that I needed to build a decent bench for the purpose. 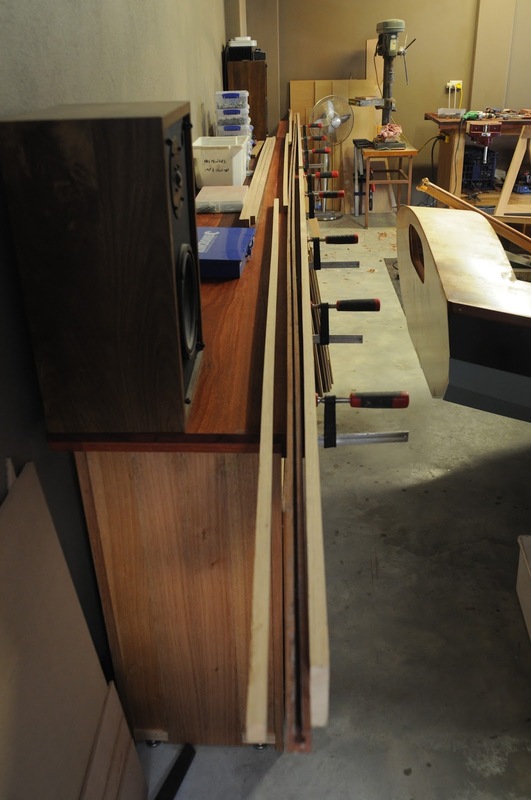 Here's the sail track piece sitting on the bench, with a couple of 3m planks clamped to the face of the bench as a straight-edge. There's quite a bit of wobble in the sail track. 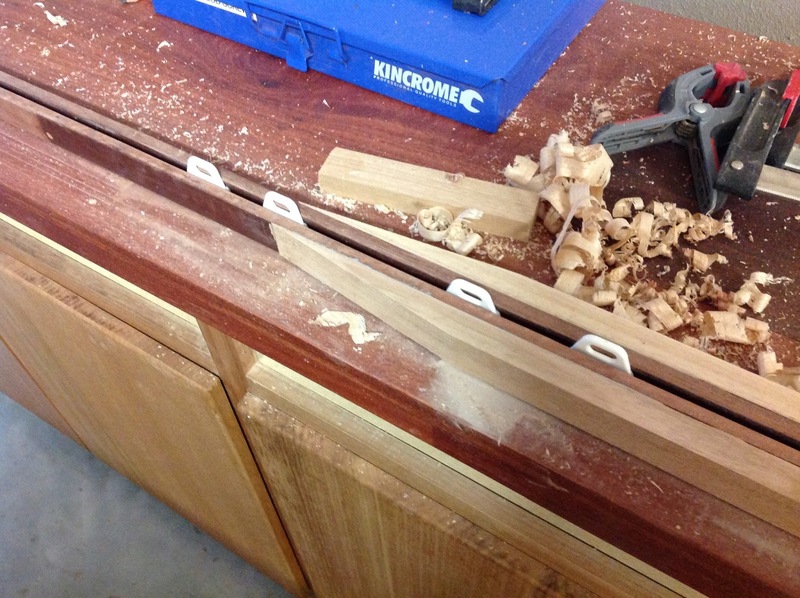 Normally I would scarp planks to make a long plank, then join it to the structure. I don't have enough clamps to do the whole 6.1m length, so instead I've cut the scarfs, and am gluing on a pair of 2.4m long staves at a time, working my way up the mast and gluing the scarfs as I go. I quite like this technique - it makes for much more manageable quantities of goop. At the top of the mast I'm tapering staves, so in order to keep everything lined up I add cardboard spacers to account for the taper. 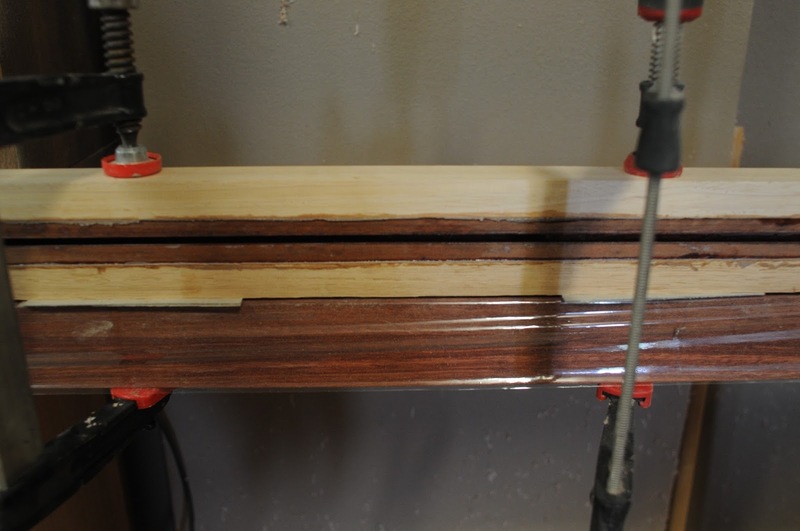 Once this pair of staves set up, I cut the detail into the back of the sail-track-containing laminated plank using my trim router, so that I can join the next couple of staves. 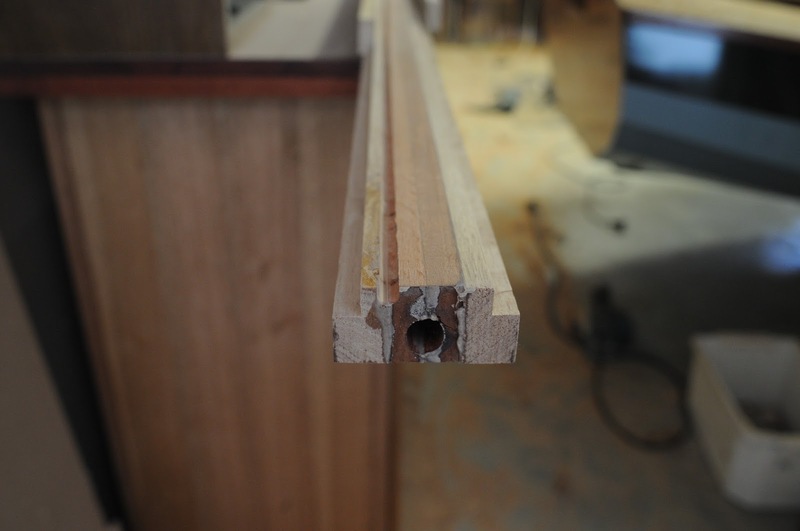 I've gone off the prototype a tad - rather than a pair of v-shaped cuts in the back to reduce weight, I've just done one cut, 6mm wide by 6mm deep, with a round nose cutter. This groove will be a nice snug fit for some RG-58 coax, which I'll use to build a VHF collinear antenna, embedded in the mast. Here's a pic of some side staves being test-fit, looking into the inside of the mast. The sail track is down, against the bench. I've made the mast about 1mm wider than the prototype, so it fits my boom fitting better. Doing things a couple of bits at a time gives me much better control of the glue lines, and allows me to keep things significantly cleaner.